Campus Insiders will stream the inaugural NOVA® Home Loans Arizona Bowl pitting Nevada vs. Colorado State today, December 29 in a pioneering fashion enabling fans to have the unique opportunity to view and engage with this NCAA bowl game streamed for free within an immersive, real-time and multi-faceted digital media experience. This is a first-of-its-kind enhanced viewing fan experience streamed by the proprietary 120 Sports video player technology – developed and powered by MLBAM. The Sports Techie community blog is excited to let our readers and followers know about the instant access to the traditional game production synchronized with supplemental, digital-only news, information, statistics, social media buzz, and other interactive elements, each live-produced by a dedicated Campus Insiders content staff. The exclusive, interactive experience at Campus Insiders features co-production with 120 Sports of digital-only pre-game, halftime, and post-game coverage. Look for real time cut-ins featuring live analysis, commentary, and social media updates. The robust video experience of the Mountain West Conference teams will originate from the 120 Sports studios and feature on-field reporting from Campus Insiders host, Shae Peppler, along with other on-site production elements. Through the partnership, college football fans have access to the enhanced fan experience delivered via the video player’s integrated ‘data cards’ on both Campus Insiders and 120 Sports platforms including CampusInsiders.com and the award-winning suite of 120 Sports mobile and tablet applications. Campus Insiders, the official media partner of the NOVA® Home Loans Arizona Bowl, will be simulcast internationally on CampusInsiders.com, 120Sports.com, 120Sports iOS, android and AppleTV apps as well as Verizon’s go90TM app. A partnership with American Sports Networks will allow fans to watch via syndicated broadcast stations reaching over 90 million homes, according to Bill Lutzen, Vice President for American Sports Network (ASN). Through ASN, a division of Sinclair Networks Group, which is owned by Sinclair Broadcast Group, Inc., the December 29th game is the only football bowl contest this season syndicated to broadcast and cable outlets. 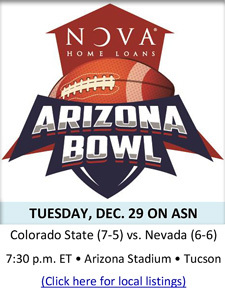 Watch the Zona Bowl on television at 7:30 p.m. ET on ASN. Campus Insiders’ live coverage will begin at 7pm ET with the NOVA® Home Loans Pre-game show. Shae Peppler will take fans right up to kick-off with up-to-the-minute news, interviews, and features. An extended halftime will include first-half highlights and analysis from Mountain West special correspondent, Wyoming defensive end Eddie Yarbrough. Additional College Football Playoff semi-final reports from Campus Insiders teams in Dallas and Miami are to be featured as part of the halftime show. Immediately following the game, Campus Insiders continues coverage of the trophy presentation, interviews and post-game press conferences. Campus Insiders features college sports video and editorial content syndicated to websites, mobile applications, over the top devices and other Internet Protocol delivered experiences. Sports Techie, this is the first bowl game to have a digitally-focused broadcast strategy orchestrated by primary digital media partner, Campus Insiders. ASN will also televise the live game to more than 88 million fans as well as post it online at AmericanSportsNet.com. The bowl business and southern Arizona benefit from this event. The goal is to become a tier one bowl. Proceeds of the inaugural bowl will go to charity. The weather in Tucson is expected to be perfect at the renovated Arizona Stadium and promises to be a fan experience, party and football match up made for all young and old fans of the game. Enjoy the exclusive Campus Insiders digital production of the Arizona Bowl match up featuring two high-powered college football offenses by clicking here.